Looking for some colorful inspiration? 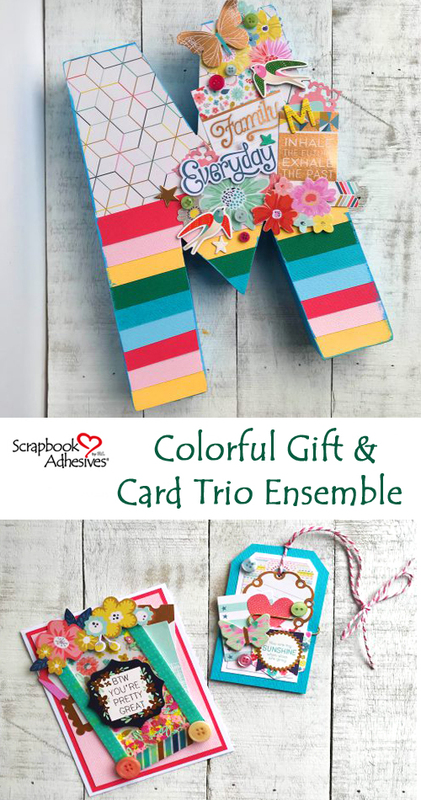 Well, take a look at this colorful gift and card trio. Hey there! Latrice here to share with you my ensemble that was displayed at the recent Creativation Trade Show held by AFCI (Assoc. For Creative Industries), formerly Craft & Hobby Assoc. Because spring reminds me of light and colorful images, it was my inspiration for my projects! First of all, let’s start with the monogrammed gift. With a blank “M” letter shape, I used a sheet of Adhesive Sheets 12×12″ to cover the front and trim off the excess with scissors. 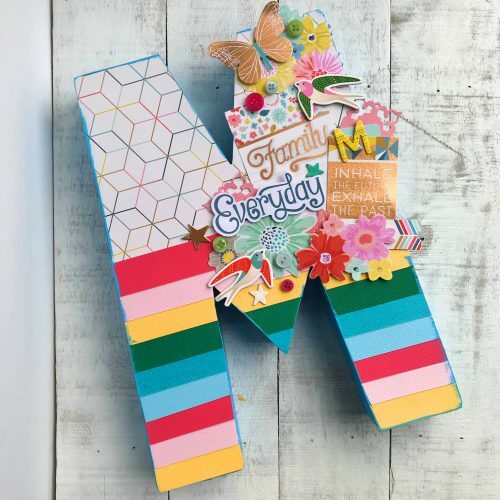 For the lower half of the letter, layer strips of solid color cardstock, coordinating with the chosen patterned papers – it creates a kind of pinata effect. Cover the top with a piece of patterned paper. 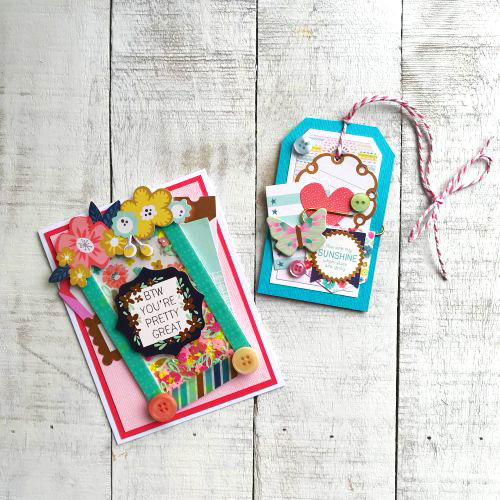 Next, choose some favorite embellishments and layer them in a cluster. 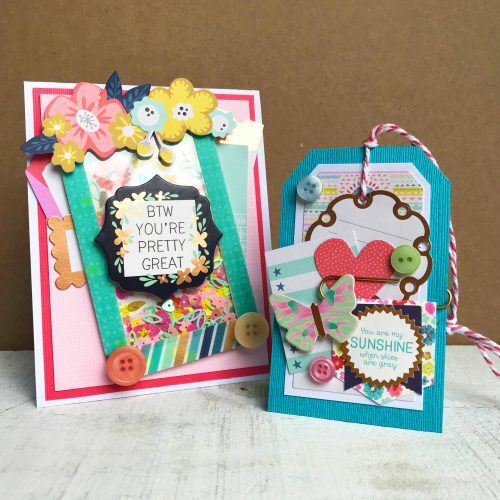 I mixed chipboard, die cuts and buttons from my stash. Also, for more dimension, use 3D Foam Squares White Mix to lift a few of the embellishment pieces. To cover untouched areas of the letter, the paint was used in a coordinating color with a foam brush. 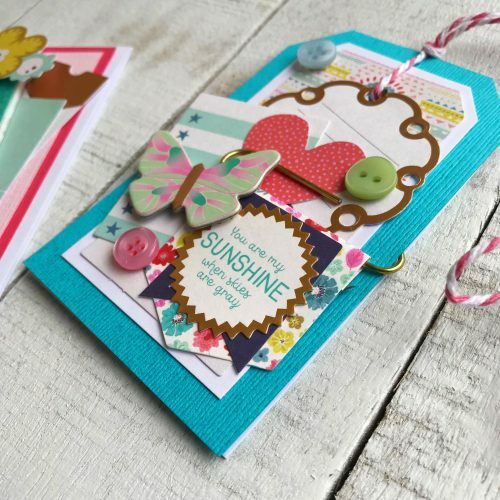 Finally, for the matching card and tag duo, I began by creating the card using the Self-Laminating Self-Laminating Pouches – Cards Wallet to create a fun shaker card. Cover the back with patterned paper and line the pouch with Crafty Foam Tape White. Just add fun sequins inside and closed it up. 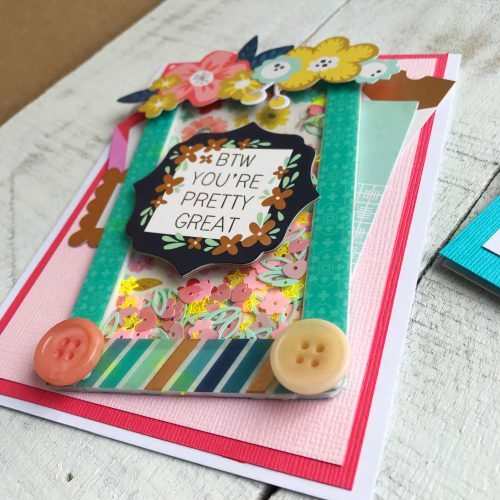 Tuck some embellishments around the edges and finish off with some chipboard flowers and buttons with Dodz Adhesive Dots Medium. For the small tag, the front was embellished using the same materials as the card. I had scored the top of a second tag shape and put it behind the embellished tag so the two tags together make one small tag shape. Thread and tie twine on top to create a tag card. So grab some spring inspired supplies and get crafting! This entry was posted in Adhesive Dots & Lines, Adhesive Sheets, Adhesives, Altered Art, Cards, Crafts & Tutorials, Crafty Foam Tape, Gifts, Home Decor, HomeHobby by 3L, Spring and tagged 3D Foam Squares Mix White, 3D Foam Squares Regular White, 3D Foam Squares Small White, Adhesive Dots Medium, Adhesive Sheets 12x12" (25 sheets), Adhesive Sheets 12x12" (5 sheets), Adhesive Sheets 6x12", Crafty Foam Tape White, Home Decor, HomeHobby by 3L, Latrice Murphy, Monogram, Paint, Pink Paislee, Self-Laminating Pouch Wallet, Spring, Tag, Twine. Bookmark the permalink. 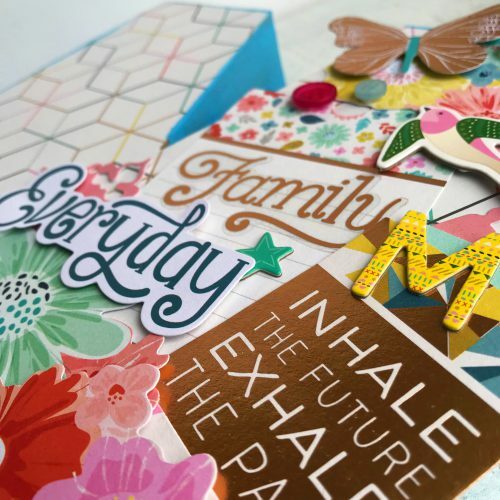 2 Responses to "Colorful Gift and Card Trio"
Loving all the color and fun mix of patterns and die cuts, Latrice!